Cosmetology student positions attract many passionate and qualified candidates. The way you present your abilities, experience, and training in your resume can help you put your best face forward and show that you are the right candidate for the job. As you start to write or update your resume, you may benefit from our large collection of cosmetology student resume templates and helpful advice for making the most of each section. Read on to find out how to use templates to make the resume writing process easier and improve the quality of your finished document. We also include tips for helping you get the cosmetology student job you want. Why Use Cosmetology Student Resume Templates? 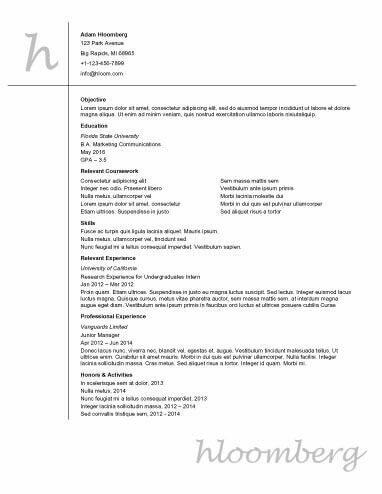 Rather than trying to come up with a resume based on a description of what this document should include, a template shows you exactly what the finished product could look like and gives you the ability to customize your resume. If you are a recent graduate of cosmetology school, your resume should emphasize your training and any real-world experience you have gained up to this point. View our collection of entry level cosmetology student resume templates designed for early-career candidates who want to apply their skills in order to gain more professional experience. Cosmetology is an industry that keeps up with trends. If you would like to make sure your resume styling looks up to date, you might find inspiration in our most popular resume templates. The style of these cosmetology student resume templates ranges from elegant to minimalistic, allowing you to choose a presentation that is likely to please prospective employers while reflecting your personality and perception of the position you are seeking. A professional cosmetology student resume template is ideal for experts in the field who have graduated from training and gone on to work at salons, spas, or other positions that use their degrees and experience. These cosmetology resume templates are ideal for conveying a narrative of advancement over the course of your work experience. Creative cosmetology student resume templates can be ideal for employers that expect you to let your distinctive personality shine through. If you are applying to work at a beauty parlor or salon that showcases the talents of each of the cosmetologists on staff, you might want to reinforce the unique content of your resume with an eye-catching format. Our simple and clean resume templates get straight to the point. You may want to let your qualifications speak for themselves and keep your resume formatting as easy to read as possible. This could be the case if you are applying for a position in a national chain with hiring managers or recruiters tasked with reviewing many applications or an employer with a more standardized work culture. Most resumes have several standard sections that contain the information employers will expect to find in this document. Here are the basics that you should cover in each of the major sections no matter which resume template you choose to use. Name: Include your full name on your resume. Reserve nicknames for later in the hiring process. Phone number: Make sure prospective employers can contact you at a cell or home number. Do not provide a current or past work number. Email and Web: Provide another way for employers to contact you. Make sure your email address is professional. You may also want to include a link to a suitable profile or website. You should start off the substantive portion of your resume with either a summary statement or an objective statement but not both. See examples of both approaches in our cosmetology student resume templates. Summary Statement: A summary statement is a series of phrases describing your experience and major qualifications for the position you are seeking. Objective Statement: An objective statement declares your intention to pursue employment and may identify why you feel you are a qualified applicant. Identify: Read over the description of the job you are seeking and identify key skills. If you possess these skills, you should try to include them in your resume. Prioritize: Determine which skills are most important for the job you want and prioritize them in your skills section. Narrow Down: Look for ways to maintain focus on your major skills. You should consider cutting out skills that are not directly applicable to the job you want. All of our cosmetology student resume templates should provide you with a sense of what to include in your resume. If you would like a more guided approach to crafting your final document, you might want to try a resume builder. This tool has a number of designs you can choose from and easily fill in your information.